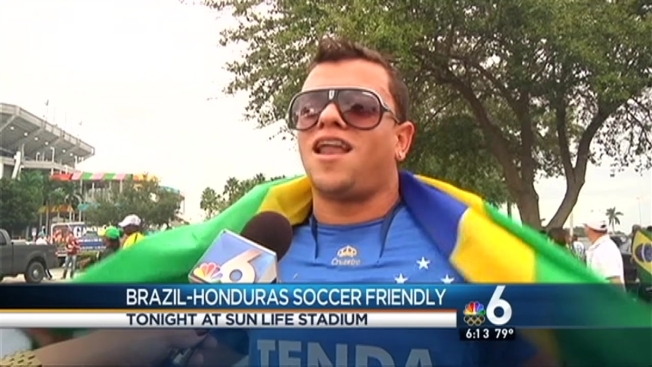 The Brazilian soccer team was in Miami for the first time in years, and they gave Sun Life Stadium a performance to remember, winning 5-0 in a friendly match against Honduras. The World Cup hosts showed why they are among the favorites for the 2014 Cup. Meanwhile, Honduras learned they despite qualifying for their second tournamenbt, they are are not quite on the same level as the Brazilians. Bernard scored in the 22nd minute, then Brazil pulled away with four goals in the second half. Dante and Maicon scored in the 55th and 66th minutes, respectively. Reserves Willian and Hulk added goals in the 70th and 74th minutes. The match was played in front of 71,124 fans, the largest crowd for a soccer match in state history. "Tickets are pacing faster than any previous soccer match at Sun Life Stadium, including Barcelona, Spain vs. Haiti, and the International Champions Cup,” Sun Life Stadium senior vice president of operations Todd Boyan told the Miami Herald last week. "It is clear that people are not waiting until the last minute to get their tickets for this match." The Brazilian team spent Tuesday night at the American Airlines Arena watching LeBron James and the Miami Heat defeat the Milwaukee Bucks. "I'm a fan of LeBron James and it was a pleasure to come here to watch the game," Brazilian striker Neymar said Tuesday. "I felt like a kid." Brazil will travel to Toronto after the game to play another friendly against Chile. "This is another opportunity to evaluate the players that have been called for these two games and give us a better indication who will be selected for the World Cup," Brazil manager Luiz Felipe Scolari said before the team left for Miami.